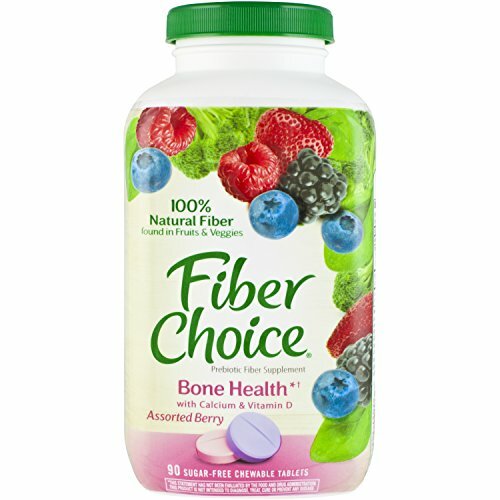 Fiber Choice Bone Health with Calcium & Vitamin D supports digestion and overall health with 100% natural fiber found in fruits and vegetables, while giving your body Calcium and Vitamin D to help build and maintain healthy bones and teeth*. Calcium is a mineral your body needs but can’t produce, so it must be obtained through foods, and absorbed in the digestive tract. Each two-tablet serving of Fiber Choice Bone Health with Calcium & Vitamin D chewable tablets contains 3 grams of fiber, 500 mg of calcium (50% of the recommended daily value) and 200 IU of Vitamin D (50% of the recommended daily value)*. 90 sugar-free, chewable tablets in great tasting assorted berry flavors. THESE STATEMENTS HAVE NOT BEEN EVALUATED BY THE FOOD & DRUG ADMINISTRATION. THIS PRODUCT IS NOT INTENDED TO DIAGNOSE, TREAT, CURE OR PREVENT ANY DISEASE. Sugar free (not for weight control). Better fiber. Better health. Dietary fiber is an important part of overall good health. In addition to maintaining regularity, fiber can also help: Lower cholesterol; Stabilize blood sugar levels; Control weight by helping you feel full and curb cravings; Manage irritable bowel syndrome (IBS) and prevent diverticulitis. Yet most Americans everyday only get about half the fiber - 12-15 grams - of the 25-30 grams that health experts recommend. Fiber Choice is the best choice to close that daily fiber gap. One dose - two great-tasting chewable tablets (no water required) - contains 4 grams of Inulin - an all-natural dietary fiber source found in fruits and vegetables. Inulin not only tastes better and has a better consistency, it is the only fiber source that helps boost calcium absorption. (Studies have shown that 8 grams per day of inulin (a natural dietary fiber) increases calcium absorption. Each serving of Fiber Choice contains 4 grams of inulin.) 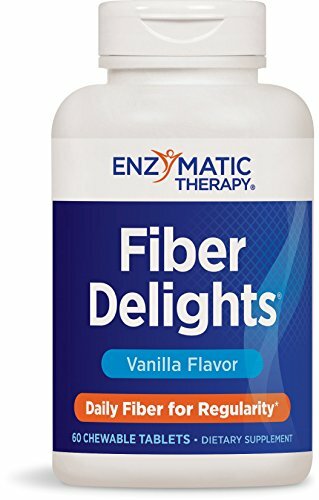 Most fiber per tablet = Best value per bottle. Tablets may contain dark speckles due to the manufacturing process of natural ingredients. Made in USA. 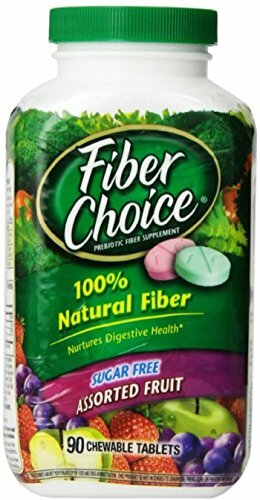 Fiber SupplementsFiber Choice Sugar-Free Chewable Tabs are one of the best supplements that can promote good digestive health and regularity. These are the chewable tablets that are available assorted fruits flavors. These tabs contain insulin that works naturally and help you by supporting your immune system.100% sugar freeSupports immune systemKeeps you strong and healthyConvenient to carryThese tablets are rich in fiber source that can help you calcium absorption.Just For You: Diet conscious peopleA Closer Look: Fiber Choice Sugar-Free Chewable Tabs contains insulin that's a natural dietary fiber present in all fruits and vegetables that can help you to absorb calcium in the body. The prebiotics fiber support your immune system.Dietary Concerns: Contains no artificial additives or flavorsUsage: Two capsules can be taken every day, preferably with meals. FDA disclaimer: These statements have not been evaluated by the FDA. This product is not intended to diagnose, treat, cure or prevent any disease. Strengthen Your Bones with the Goodness of CalciumFortify your body with Calcium, Vitamin D and fiber. 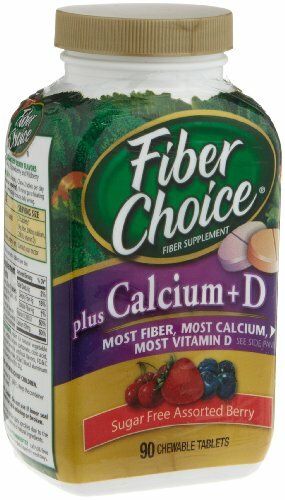 Fiber Choice with Calcium Chewable Tabs contains Calcium and Vitamin D that helps to strengthen bones and teeth while the fiber supports the digestive system and helps to absorb the calcium. Aids to strengthen bones and teethPro-biotic fiber helps to absorb calciumSugar freeFiber Choice with Calcium Chewable Tabs is sugar free and helps to strengthen bones and teeth. It also has inulin, pro biotic fiber that helps to absorb the calcium and boosts the immunity of the body. 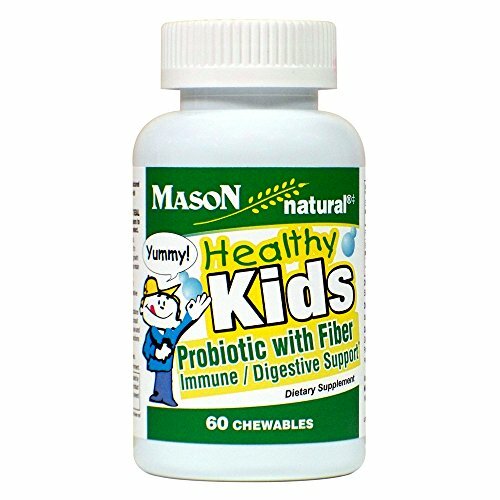 Just For You: Suitable for everyone over 6 years A Closer Look: Fiber Choice with Calcium Chewable Tabs has 50% of calcium that an average body requires on a daily basis with 3 grams of fiber and 200 IU of Vitamin D. Usage: Recommended usage is 4 tablets per day. For children above 6 years it is 2 tablets per day. FDA disclaimer: These statements have not been evaluated by the FDA. This product is not intended to diagnose, treat, cure or prevent any disease. Dietary fiber is an important part of your overall good health. In addition to maintaining regularity, soluble fiber can also help: promote good digestive health, support colon health, enhance your immune system to keep you healthy, control weight by helping you feel full longer and curb cravings. 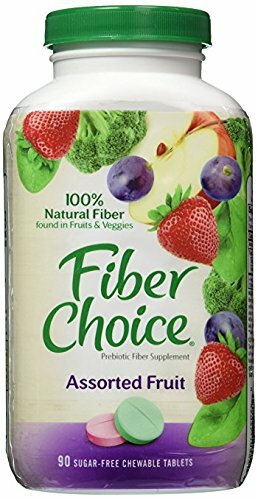 Fiber Supplement is the best choice to close that daily fiber gap easily and naturally. 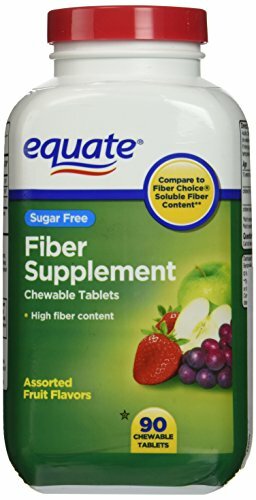 One dose of two great-tasting chewable tablets (no water required) - contains 4 grams of Inulin - an all-natural dietary fiber source found in fruits and vegetables. Inulin not only tastes better and has a better consistency, it is the only fiber source that helps boost calcium absorption. Supports to control weight by helping feel full and curb cravings.